The original version of this report included public opinion data on the connection between religion and morality in China that has since been found to have been in error. Specifically, the particular survey item that asked whether one needed to believe in a higher power or God to be a moral person was mistranslated on the China questionnaire, rendering the results incomparable to the remaining 39 countries. For this reason, the data from China has been removed from the current version of the report, re-released in May 2014. For further information, please contact info@pewresearch.org. Many people around the world think it is necessary to believe in God to be a moral person, according to surveys in 39 countries by the Pew Research Center. However, this view is more common in poorer countries than in wealthier ones. In 22 of 39 countries surveyed, clear majorities say it is necessary to believe in God to be moral and have good values. This position is highly prevalent, if not universal, in Africa and the Middle East. At least three-quarters in all six countries surveyed in Africa say that faith in God is essential to morality. In the Middle East, roughly seven-in-ten or more agree in Egypt, Jordan, Turkey, the Palestinian territories, Tunisia and Lebanon. Across the two regions, only in Israel does a majority think it is not necessary to believe in God to be an upright person. Many people in the Asian/Pacific and Latin American regions also link faith and morality. For example, Indonesians, Pakistanis, Filipinos and Malaysians almost unanimously think that belief in God is central to having good values. People in El Salvador, Brazil, Bolivia and Venezuela overwhelmingly agree. However, most Australians take the opposite position – that it is not necessary to be a believer to be a moral person. And in Latin America, the Chileans and Argentines are divided. In North America and Europe, more people agree that it is possible to be non-religious and still be an upright person. At least half in nearly every country surveyed take this view, including roughly eight-in-ten or more in France, Spain, the Czech Republic and Britain. In these two regions, Americans are unique – 53% say belief in God is necessary to be moral. These are among the main findings of Pew Research Center surveys conducted among 36,854 people in 39 countries between 2011 and 2013 (see “Survey Methods” for more details). The survey also finds that publics in richer nations tend to place less emphasis on the need to believe in God to have good values than people in poorer countries do. The U.S., however, stands out as a clear exception to this pattern. 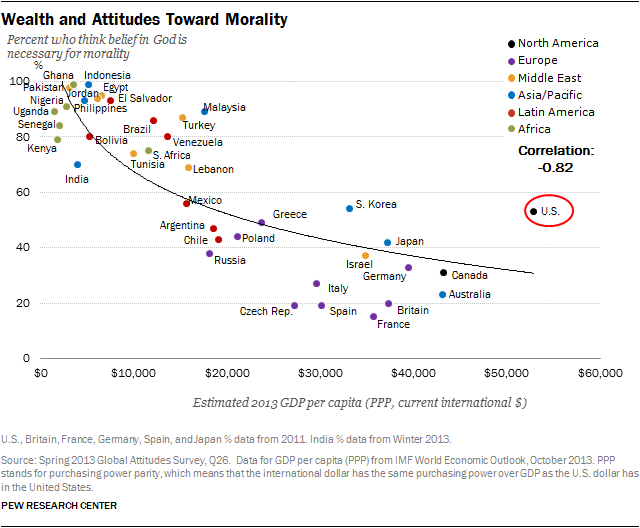 Americans are much more likely than their economic counterparts to say belief in God is essential to morality. There are also significant divides within some countries based on age and education, particularly in Europe and North America. In general, individuals age 50 or older and those without a college education are more likely to link morality to religion. For example, in Greece, 62% of older adults say it is necessary to believe in God to be a moral person, while just 29% of 18- to 29-year-olds agree. In the U.S., a majority of individuals without a college degree (59%) say faith is essential to be an upright person, while fewer than four-in-ten college graduates say the same (37%).